Do you want to sell your zine at Quimby's? Has a new issue of your zine or minicomic come out? 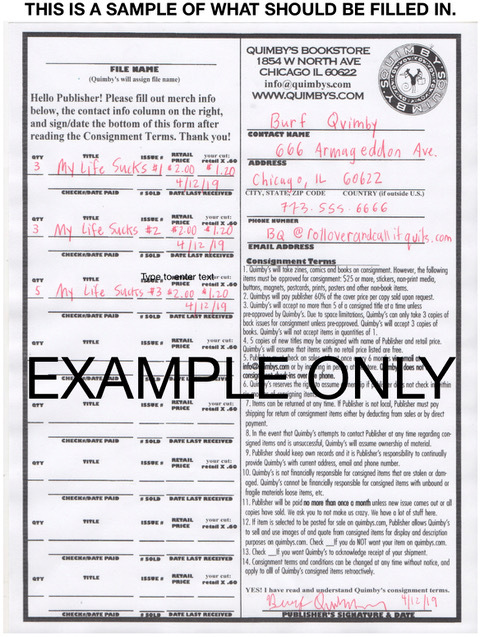 Print out our consignment terms & form at this link here and send us 5 copies of the latest issue of your zine/comic along with the completed form. For books we start with 3. Make sure to complete both columns! Remember to state the retail price on either the form or your publication! We've gone through the trouble of filling out an example consignment form on the right that demonstrates what should be filled in. If you do not include your contact information and a retail price, we will assume that your book/comic/zine is free and put it in our free area, where it will surely get lost amid the multitude of flyers. Don't let that happen. Your work deserves better. Oh, and if you're willing to put your zine/manifesto/pamphlet on consignment, there is no need to send us a sample copy or review copy. Our consignment policy is for reading material, not postcards, crafts, stickers, patches, etc. If you are interested in pitching those items to us you can submit information about it at our contact form. Want to be an extra awesome consignor? Check out this helpful primer made by former Quimby’s employee Nicki Yowell.